The “JOURNEY TO THE EXTRAORDINARY” is now on mp3 Over the years, I’ve had dozens … no, hundreds … of people tell me they desperately wanted to attend my “Journey to the Extraordinary” experience. But they just couldn’t. The dates didn’t fit their calendar; the location didn’t fit their needs, or the tuition didn’t their budget. I understand that. So those same people asked me to please make the “Journey” available to them via audio recordings. Well, I listened to you, and here they are. An extraordinary album of mp3s. Sign up for the next Journey to the Extraordinary $1497.00 Learn More! You get every word I spoke, and you are led through every exercise the live audience experienced. Nothing got left out. In fact, you even print out the same 156-page manual that the audience received. And let me tell you, the “Journey” is powerful. And this complete, live, unedited recording of the “Journey” is something that can and will dramatically improve your life, your work, and your relationships … if you let it. But don’t take it from me. Listen to what Paul Morrison from ReMax has to say. He attended my most recent “Journey” in Orlando. And this is what he wrote to tell me just a few days ago. Learned to be more positive and put more balance into his life. 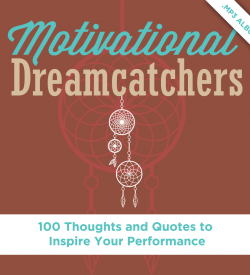 A process for setting goals and an easy, 10-minute exercise that ensures the attainment of your goals. A simple way to turn ideas into action … and why the first action step you take significantly shortens the road to success. The danger of living in your comfort zone and how to get out of it. How to know which risks are most likely to pay off. Good Leaders Improved Their listening skills and became more patient! The “Journey” is packed full of information, skills, techniques, strategies and exercises that will help you improve every aspect of your life and work. I urge you to attend a “Journey,” and I urge you to get a copy of this 15-part mp3 album. You owe it to yourself. So go ahead and grab your copy of the “Journey” mp3s. Everyone wants to be happy. Many yearn for success. Most have no idea how to have either. But now you can have both. 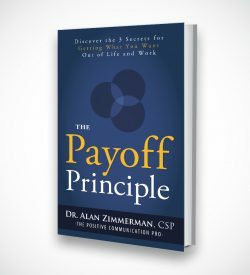 In The Payoff Principle, you’ll learn the simple formula for getting the payoffs that you want in your life and career. Purpose + Passion + Process = Payoff. 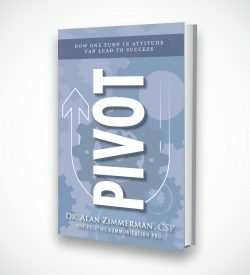 Dr. Z delivers a live presentation focused on taking you from "Vision to Payoff" in this 88-minute DVD.